England's national league, the 4NCL, developed into its usual two-horse race last weekend when Wood Green and Guildford both won all 10 matches before squaring off in Monday's final round. It was possibly the strongest ever UK club match, as both teams clocked a 2650 average rating (world top 100 or better) and were packed with elite grandmasters. 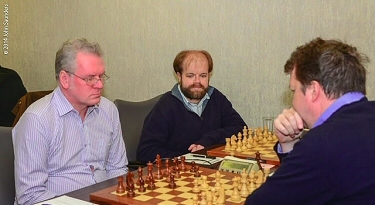 Wood Green were led by the England No1, Michael Adams, and included Alexei Shirov, who had already played on the winning teams in the Russian and German leagues. The Guildford manager, Roger Emerson, countered with a shrewd approach, basing his team on hungry and ambitious young GMs headed by Maxime Vachier-Lagrave, known in France as MVL and one of those who have made 1990 the best vintage birth year for GMs in chess history. Guildford struck early before the key encounter by fielding their best squad in the penultimate round, which they won 8-0, and so took their game points tie-break total ahead of Wood Green, meaning that 4-4 in the crunch match would win the title. The final looked level after two hours play, but swung to Guildford when Gawain Jones scored with a fierce attack and the world's top teenager, Anish Giri, 19, outplayed the England No2, Luke McShane. MVL provided the clincher when he boldly took on Adams in the Englishman's pet line in the Najdorf Sicilian, invaded with his rooks and finished off in this week's puzzle. The result puts the young Frenchman on the verge of the world top 10. Demoralised Wood Green failed to win a game and Guildford triumphed 6-2. Earlier Nigel Short won with this speedy attack in Guildford v White Rose. The Be3/Qd2/Bh6 plan is a routine method to undermine a king's Bg7 guard and even the tactical shots 19 Nf5! opening up the g file and 27 Rd7! forcing mate are well-known in such positions. The move which most interested me was 5 Ne2! in the opening. 5 Nc3 b5 is normal, when Black will have counterplay when White castles long. Short's subtle 5 Ne2 waits for Black to commit to b7-b5 (when White could counter by a2-a4), make a passive response (when c2-c4 is an option) or play as in the game e7-e5 which eventually weakened d5 and f5. 3357: 1...Ra1! 2 Kb4 Ra2! and White is helpless against Rga1 with Rxd2 and Ra2 forcing Rxa2 bxa2 or else winning the a3 pawn when it's easy.